Hurricane Sandy Victims Battling Freezing Cold Weather, Why? Hurricane Sandy victims battling the freezing cold weather. Why is it we Americans give money or aid to foreign countries and we cannot help our own citizens? Grab that photo-op Obama. You’re a failure. Why does the foreign countries get aid when our own people need it? If you have the answer to my question please insert comment. 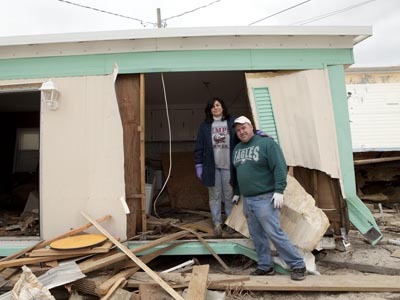 Long Beach Island residents return to their properties to assess Sandy damages in the heavily affected section of Holgate three weeks after the storm. Once the storm is no longer a front page event, people forget or they figure every thing is okay. It will take years for this clean up to be done. Just think of all electrical wires that are down and the damage to the electrical systems to peoples homes because of the salt water. Yet many homes on the water that were destroyed will be built again. It doesn’t make sense. Israel was the only country to send foreign aid to the Sandy victims. Sandy victims must come to the realization that the gov’t. can’t and won’t do everything. This country depends on each other not on a gov’t. handout. This is the harsh realization that our gov’t. is a failure. At least Bush gave Katrina victim trailers to live in. Obama used the Sandy crisis for a photo op and that is all.